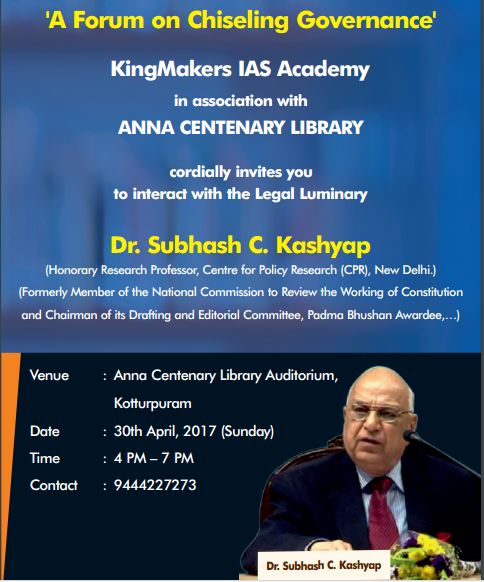 King Makers IAS Academy, Chennai in association with Anna Centenary Library organises "A Forum on Chiseling Governance" on 30th April 2017 at 4pm-7pm at Anna Centenary Library Auditorium. Dr.Subhash C.Kashyap, Honorary Research Professor, Centre for Policy Research, New Delhi will be the resource person. Admission free ! All are welcome !